The University of Oklahoma-led Southern Climate Impacts Planning Program, a multi—institutional stakeholder driven research team, is the recipient of a National Oceanic and Atmospheric Administration grant totaling $2.3 million over three years. SCIPP was established in 2008 to help south central U.S. communities build resilience to weather and climate extremes. The OU-led SCIPP is one of 11 NOAA Regional Integrated Sciences and Assessment teams across the country covering the states of Texas, Oklahoma, Louisiana, Arkansas and coastal Mississippi. SCIPP improves a community’s adaptability to the adverse effects of climate extremes (tornadoes, hurricanes, floods, wildfires, winter storms, droughts, floods and rising sea levels) by focusing on planning and preparedness, coastal impacts, climate adaptation, use of seasonal to sub-seasonal predictions and drought. Within these five areas, SCIPP works to identify and build new decision support tools, synthesize information for use in planning, conduct research to understand physical and social factors affecting risk, and study how information is shared within communities to improve individual and collective resilience. Examples of a SCIPP tool includes the Simple Planning Tool, developed in collaboration with city planners and emergency managers in Oklahoma and Arkansas. The tool allows local officials who may not have a technical background to assess their risk. In another example, SCIPP team members synthesized information for use in planning by analyzing historical climate information and model projections to inform how climate may affect the U.S. Strategic Petroleum Reserve’s mission-critical objectives. Added: The NOAA Atlas 14 Precipitation Frequency Data Server tool to the Heavy Rainfall and Flooding section. Appendix C was updated to include NCA4 Volume II: Impacts, Risks and Adaptation in the U.S. (2018). Added: A Dam or Levee Failure section and accompanying definition and description in Appendix A. The Air Quality section was re-named Poor Air Quality. The tools are available by clicking on the Data Tools tab or at the following direct links http://www.southernclimate.org/documents/SPTAR.pdf or http://www.southernclimate.org/documents/SPTOK.pdf. Cover pages of version 1.5 of the Simple Planning Tools. In June 2018, the Oklahoma Climatological Survey, with the support of SCIPP and NIDIS, hosted an Oklahoma Drought Plan Advisory Meeting. The aim of the meeting was to discuss strategies for updating the 1997 Oklahoma Drought Response Plan. In attendance were representatives from various state agencies and sectors. This summary report details key findings from the meeting, including discussions that centered around the 1997 plan, drought monitoring, communication, response, collaboration, and suggestions for the updated plan. Recently, 13 USFederal agencies released the Fourth National Climate Assessment (NCA4), Volume II, Climate Change Impacts, Risks, and Adaptation in the United States. The National Climate Assessment is the most comprehensive, authoritative assessment of the effects of climate change on the US economy and communities. Included in the NCA4 is an assessment of climate variability and change and its impacts across the South Central United States. Notably, the states comprising the SCIPP region are represented in both Chapter 19: Southeast (Arkansas, Louisiana and coastal Mississippi) and Chapter 23: Southern Great Plains (Oklahoma and Texas). Threatened infrastructure, altering ecosystems and species distributions, increased heath threats, urban and rural industry impacts, and sea level rise are among the major concerns and challenges detailed in the Southeast and Southern Great Plain chapters. In economic terms, the impacts add up to billions of dollars. The assessment finds that early action to address these impacts can lower economic, environmental, social, and cultural costs and could help to prevent conflict or displacement from lands and resources. Both chapters lay out the changes already being felt in the South Central United States, as well as what lies ahead. The top findings for each region are included below. Expanding urbanization is creating new climate vulnerabilities for cities, especially on infrastructure and health. Poor air quality due to pollutants, wildfires and allergens, as well as heat-related illnesses are expected to increase with longer summer heat waves. Cities will also experience a greater risk to vector-borne diseases as favorable conditions for transmission will expand to year-round. More frequent heavy rainfall and flooding events are weakening the region’s roads and transit, and by 2050 the Southeast is expected to have the most vulnerable bridges in the nation. Sea level rise has increased flooding in coastal and low-lying regions. Rising temperatures and changing ocean currents have contributed to increases in local relative sea levels at a rate higher than the global average and is resulting in greater high tide flooding frequencies and inland-moving storm surge. As sea levels continue to rise, flooding from these events are expected to increase in both frequency and duration and will further impact regions within flood prone areas such as on road closures, storm water management systems, and deterioration of infrastructure due to saltwater. Ecosystems are threatened by a changing climate and will be transformed from shifting winter temperature extremes, wildfire patterns, rising sea levels, hurricanes, floods, droughts, and warming ocean temperatures. By 2100, a lengthening freeze-free season and less frequent and intense cold temperatures will lead to the northward migration and redistribution of tropical and subtropical species and organisms including insects, birds and plants. In addition, increased wildfire risks and invasive species will negatively impact the agriculture and forest industries. Rural communities will experience greater health and economic vulnerabilities from increasing heat extremes and changing seasons. Agriculture, timber and manufacturing sectors are imperial across the Southeast and are at risk of decreasing productivity and losing over one-half billion labor hours to extreme heat-related impacts by 2100. More than half of the land across the Southeast remains rural and will experience greater health risks and stresses on cooling demands, especially on poverty-stricken areas. Demands for food, energy and water resources will increase with growing populations, urban economic development opportunities and increasing drought periods. Recent severe droughts exposed challenges at the intersection of these three resources, negatively impacting agriculture production, water consumption and treatment, and energy production. Increasing hydrological extremes along with a projected 20% increase in water demand by mid-century due to population growth will continue to deepen these impacts across the Southern Great Plains. Habitats of species are being altered by a changing climate. Rising temperatures and the shift to a drier climate have led to the northward migration of species such as birds and butterflies and threatens the decline of certain species including the lesser prairie-chicken. Higher water temperatures and lower salinity levels have led to an increase in harmful algae blooms and threatens sensitive estuarian species. Infrastructure is becoming increasingly vulnerable to rising temperatures, extreme precipitation and continued sea level rise. Longer, hotter summers will create more stress on cooling systems, energy utilities and road surfaces. Increases in both heavy rain and drought periods will further threaten roads, aging pipelines, sewer lines, building foundations, and several dams and levees. The coastal region of Texas is especially vulnerable to rising sea levels, experiencing higher than normal rates due to the extraction of fossil fuels and groundwater. By 2050, an expected $30 billion in property values will be exposed to rising sea levels and more frequent flooding. These changes will negatively impact human health, including through heat related illnesses and deaths, and diseases transmitted through food, water and insects. Climate-induced changes pose an existential threat to Indigenous peoples, including to tribal cultural traditions and community resilience. Excessive heat, drought and the changing of native species are disrupting ceremonial cycles and increasing health threats. Efforts to build community resilience can be hindered by economic, political and infrastructure limitations, but opportunities exist to implement adaptation practices otherwise limited to city and state governments. In the face of such risks, groups across the region are working together to identify opportunities for adaptation and to lessen impacts from a changing climate. Current regional adaptation actions across the SCIPP region include integrating climate services and early warning systems to improve the development of sustainable infrastructure and increase agricultural production. Other examples of adaptation measures include installing cool roofs to lessen heat impacts, improving planning and monitoring prior to flood events, strengthening or relocating critical infrastructure, participating in the Federal Emergency Management Agency’s Community Rating System program, practicing prescribed fire to reduce wildfire impacts, and implementing drought contingency plans and water-use cutbacks. As the science is becoming more evident, adaptation strategies will continue to increase the opportunities for policymakers, practitioners and scientists across the SCIPP region to increase resiliency and lessen impacts in a changing climate. every four years. The main objective is to help Americans better identify, avoid, and/or reduce climate-related risks. The National Climate Assessment process relies on consensus and undergoes extensive review. author of which was former LSU SCIPP program manager Dr. Lynne Carter, and five technical contributors including LSU SCIPP’s Vincent Brown and Dr. Barry Keim. The Southern Great Plains chapter has 15 authors including OU SCIPP’s Dr. Mark Shafer, and one technical contributor. Both chapters are backed by more than 190 citations from published articles, reports, and books. The Southern Climate Impacts Planning Program (SCIPP) is pleased to announce a new tool that will assist planners and emergency managers across the state of Arkansas with assessing their long-term climate risks. It is called the Simple Planning Tool for Arkansas Climate Hazards. In addition to the previous hyperlink, the tool is also available by clicking on the Data Tools tab on our website. SCIPP has been actively involved with emergency management and planning sectors throughout the South Central U.S. over the past few years. 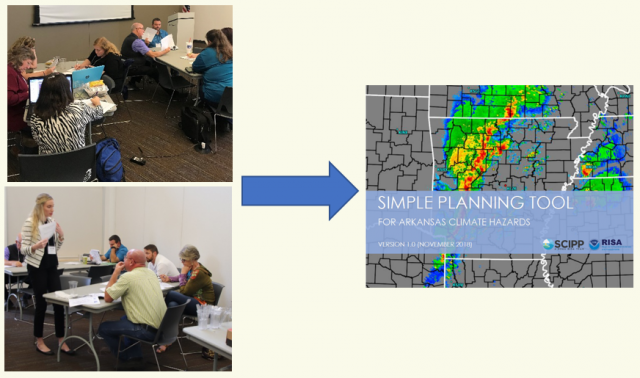 In 2017 and 2018, SCIPP partnered with the Arkansas Chapter of the American Planning Association to host meetings in Bentonville and Siloam Springs for planners and emergency managers who were interested in improving hazard planning and building resilience. Through those interactions, the need for a tool that could help identify locally-relevant climate information that can be used in plans such as hazard mitigation plans, land use plans, comprehensive plans, etc. was identified. Meeting participants said that they did not always know where to find data and/or which organizations to trust. Iterative feedback led to SCIPP developing the Simple Planning Tool for Arkansas Climate Hazards. A version for Oklahoma is also available. Meetings with planners and emergency managers about increasing resilience led to the development of the Simple Planning Tool for Arkansas Climate Hazards. The tool is a compilation of relatively easy-to-use online interactive tools, maps, and graphs that depict historical climatologies. It also provides state-of-the-science summaries regarding what is known about how each hazard is being and is expected to be impacted by climate change. It is primarily designed for planners and emergency managers who serve small- to medium-sized communities but may also be of interest to those who serve larger areas. While it may not answer every question one has about hazard climatologies and future trends, it aims to cut through the internet clutter and point to relatively simple data tools that can be used during planning processes and in plans.